Someone once told me that playing a musical instrument is a must part of a curriculum in any Swedish high school. Whether this little fact is true or not, it is probably not lost on anybody how not being in a band, if you are from Sweden, is equal to an American never to have thrown a football (substitute playing soccer if you are from somewhere else in the world). Also, interestingly enough, the glut in bands coming out of Sweden does not translate in the lack of instrument playing quality. You may or may not like the style or musical direction of the band, but when it gets to Swedish musicians (or most of them anyway), the dudes (and sometimes dudettes) can handle their instruments. The three track Arcane Secrets may be the first ever entry for the Stockholm Astrophobos, but these guys are impossible to confuse with rookies who have picked up instruments for the first time in their lives. The promo sheet gives a glimpse of info that Astrophobos members played earlier in a more traditional metal band, although it is unknown which band it was and for how long. Subsequently, their mutual fascination with older school Swedish-Norwegian black metal led the trio to form Astrophobos and bring in the session drummer to record the EP. Astrophobos will not be offended, and most likely will be pretty pleased, once every reviewer who lays his/her hands on the EP will list Dissection, Naglfar, Profundi and Lord Belial as their obvious influences. At the same time, Astrophobos guitars are significantly more full-bodied than Dissection thinner icy blades, although they can still tremolo with the best of them (the beginning of the title track). Thicker guitars, especially in the opener Divine Necromancy, and lower, Vikingy, more growling than rasping, vocals, create atmosphere more Nordic and spiritual than they hint at hellish matters. The first pair of tracks, never becoming overly brutal, and hinting at a folk touch in the title track, provide a perfect fit to the word Arcane contained in the aforementioned title. 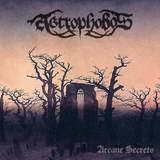 Astrophobos are more about mysticism in their delivery, than they are evil, and that is probably OK with the band. Still, not to be confused with the purely melodic Gothenburg crowd, Astrophobos blasts and rages away in much more deathly closer Crossing the Abyss, having set it up with a monstrous opening distorted riff. If the band’s playing skills manifest themselves through crafty leads (Divine Necromancy, Arcane Secrets), they still demonstrate more maturity with careful song-writing, tempo variations and sound. Arcane Secrets is as far as it gets from the basement demo band, but whether Astrophobos has enough material to last them a full-length (and more) is an interesting question, given the population density in the genre, both in their country and the rest of the world. The EP, meanwhile, is up for sale, and the quality presented merits the money spent.